As I was standing at the checkout at Safeway a man behind me, upon seeing my coupons, jokingly said, “So are you going to get paid to shop here?”. To which I said, “That’s my goal!”. Well, I did come away having spent money, but it sure wasn’t much considering all that I walked out with! =FREE plus $.35 overage after deposit! -$1.37 after 10% discount from Grand Reopening card sent to me! 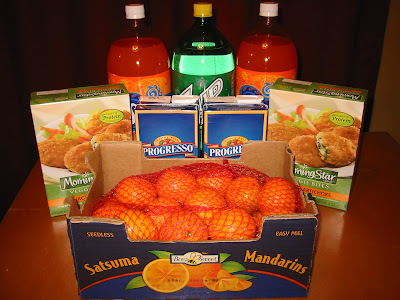 So I ended up getting all of this for free and paying $.50 less for my box of oranges! Total OOP: $6.07!!! and received a $5 catalina! I think I just might start to become a little addicted to this promotion now that I have it rolling. I plan on baking alot this holiday season, though, so this will really help me do so on a small budget. Yay for couponing! Check out the other HFTH participating products here. Thank you so much for the heads up on the Damascus Safeway Morningstar Farms clearance and coupons! My sister and I are dieting together, we both have well over 100 pounds to lose (still!) and Morningstar products are one product we can have. Even tho the coupon said "Do Not Double" the kind folks at my Safeway (they know me well, there!) said "Let's see if it works" and they scanned it and it took! So I got 4 boxes for free, my sister got 4 boxes for free, she is down 43 pounds (120 more to go) and I am down 30 (115 more to go!) Thank God for your wonderful blogs and a diet program that finally works for us! Nice! That was definitely a sweet score! The super coupons are Safeway store coupons. For instance, the coffee mate is priced at $3.49, but with a super coupon found in the ad, it takes off $1.50. Plus, you can combine it with a manufacturers' coupon for an even better deal. Wow! I am just getting the hang and saved 61% when I went. Thanks for sharing your deals! It is helpful to see. Also the super coupon…what are those? I have my own "thanks to safeway" trip to share. This afternoon I was at an Oregon City/Gladstone Safeway near the Harley Davidson store. They had a lot of cheese marked with clearance stickers. I scored 8 bags of Kraft naturals sharp cheddar shredded cheese & a 16 oz block of mozzarella. All 9 cheese products each had (3) .75 clearance stickers. I also had one 1.00 off 2 kraft coupon, which I doubled, which took the price of the shredded sharp down from .25 a bag to free! My total was $1.99 for all of the cheese. I saved 93%! Judith, yes it is $25 before manufacturers coupons. Question about the Ecoupons. If my Total comes to just above $25, but then with the deducted ecoupons it is below $25, will my $5 Cat still print? I got the Morningstar Farms coupon book and the $2 off coupon says DND on it. Even without doubling it made for some cheap Morningstar Farms products! yes, the C&H sugars and the pasta are part of the promo, there are actually tons of participating products not listed in the current ad. Just look for the HFTH tags under the products at the store. 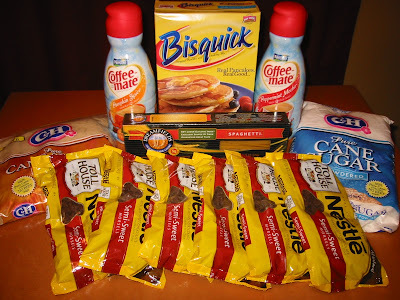 I bought the $1/2 Nestle coupons off a coupon site as I knew I would be wanting to stock up. They were like, $1.20 for 20 or something like that. HFTH promotion at safeway. I don't see the C&H listed in this weeks ad or the pasta. Is that part of the promtion? I love Safeway – the fact that you can use Shortcuts.com AND cellfire.com to utilize even more coupons is the best. The girls over at saving4myfamily used to post a lot about Safeway but since they've been on a break it's been so nice to get the scoop on Safeway from your blog – thanks! Great job Rebecca! I live in Damascus and plan on hitting them up for the Morningstar Veggie Bites and the soda. Thank you for the tip.